Thomas Cromwell issued an order to the English Church in 1538 requiring that a record be kept of the christenings, marriages and burials in each parish. This act and any subsequent act until the marriage act of 1757, did not specify what form this entry should take - thus the considerable variation seen both between parishes and between the clergy. It is often worth examining a few years records to see if any patern is followed e.g. the Maughold registers c.1715 leave blank the the column indicating parish of residence unless the party comes from another parish - thus allowing a reasonable imputation of a parish residency. The early records often included much incidental material - sections of these were often included in parish histories etc., some of these are referenced later. In 1732, Bishop Wilson wrote the following:-" I desire that the vicar for the future set down by what authority the Persons are joynd together in matrimony, whither by lyeence and by whose lycence, or upon banns in the church." The Marriage act of 1757, modelled on the earlier English (Hardwicke's Act) required a more detailed entry giving the parish/town of residence, the signatures (or 'X's) of the two parties together with those of two witnesses and if either party was under 21 a declaration of consent by the parent or guardian. The later 1849 act asked for rank or profession of the two parties and their fathers, although not asked for, the full date of birth is often given. Although by 1538 the Manx Church had come under York, the first parish registers date from 1598 - the earliest being that of Ballaugh followed shortly afterwards by Jurby and Michael. In 1610 Bishop Phillips issued an order "That there be a Register Book kept by every Minister within his several charge, of the Christenings, Marriages and Burials, etc." Bishop Lake in 1683 commenting on the neglect of register keeping, which he ordered to be done, required "all decayed or lacerated" books to be re-copied and also ordered that "Coppies of all Regrs be brought in once every year to be entered in the Bopps Regry". Yet another inspection of the registers was ordered in 1717 "so that the Bishop may see in what order the books are, and those who have not bound books for their use, may at the charge of the Bishop, provide such immediately, there being a Bookbinder lately come to the Island." Feltham obviously examined the registers in 1797 and commented on the poor state of many early registers. Arbory - Earliest is a copy made c.1729 but only the first set of leaves are present. It would appear that a complete register has been lost at some period. The table below (taken from [Nari94]) gives the various earliest dates of Baptisms, Marriages and Burials to be found in the registers, the Parish Churches are indicated , the town churches were originally chapels of ease until parish re-organisation in the late 19C. Most of the town churches did not have a burial ground and some of the smaller chapels of ease were not licensed for marriages. There are gaps in any or all of these in some parishes - the following known missing sections are not exhaustive. It may be worth trying the Bishops Transcripts (an annual copy from 1733 extracted from the registers and presented at the annual convocation though there are also many gaps in these as well - e.g. the Bishop's transcripts can supply most of the missing marriages in Lonan and Marown; wills may also supply some burial information (e.g. see Arbory Wills). One possible explanation of some missing entries may be given by Archdeacon Kippax's note of 1751. For an explanation of one of the Braddan gaps see the story of its destruction. All the parish baptismal records were copied by the General Registry in 1910. This copy is indexed by church with surnames in alphabetic order and then chronologically. This copy may be consulted and a copy obtained from the General Registry; it is also available on microfilm at the Manx Museum. The IGI is available on microfiche (and on-line at at www.familysearch.org) and indexes all baptisms and marriages in alphabetic order (of sorts!) for the whole Island. 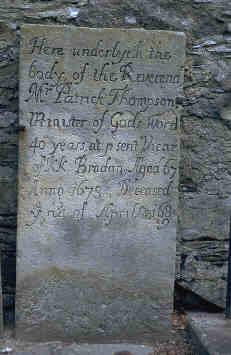 The Family History Society has transcribed most Island burial registers (currently Ramsey is still to be done, though a couple of others including Onchan and Braddan are in the course of revision), they are avalable for purchase (see IoMFHSoc web site) and also for consultation at the Manx Museum; the late Brian Lawson constructed an index to all these registers - see <www.iomfhs.im> - follow research link. In all cases be prepared to find names spelled differently (especially initial C/K) or even translated from 'Manx' to 'English' Boddagh/Boyde, Kinry/Harrison, Mylvorrey/Morrison, Corjeag/Cavendish, Kneal/Nelson). As usual be prepared for transcription errors (especially in the IGI records). In the 17th century the Island still appeared to follow Roman Catholic custom and baptise the child within a day or so of birth - see comment by churchwardens of Arbory in 1665. By mid 19th centrury there could be a few weeks gap between birth and baptism. Look to see if the record is at a later date e.g. in 1817 the Vicar of Malew had to repeatedly give public notice that the parents attend after divine service to give the names of the child and parents. Sometimes these entries were made at some later date. Some Vicars appeared to be very lax - the Rev E Caine in Onchan c.1841 seems not have recorded many baptisms - see Consistorial Court record of 1865. Born before marriage - Under Manx Law, until 1929, a child born out of wedlock but within two years of marriage was considered legitimate. These entries may be under the mother's name. Illegitimate - the Manx custom was to give the surname of the father when known (and generally they were, as one of the midwives duties was to discover the father's name). The name of the father, if not in the Parish Register, can often be found from Presentments or from Chancery Court records when the mother applied for financial support. The IGI follows English custom in indexing under the mother's name if the parish register indicates illegitimacy. You may have struck a dissenting family - check civil entries if after 1849, some earlier births were also recorded at this time - Brian Lawson also has an index to those records that were called for by civil authories in 1849 - see <www.iomfhs.im> ( follow research link); later Roman Catholic records are available on microfilm at the Manx Museum. It may have occured off the Island - Liverpool had a considerable interchange with the Island from the start of the Stanley period but particularly from its growth period in mid 18th century. Whitehaven was another town with strong Manx links. The FHS has an index of Strays consisting of baptisms, marriages and burials away from the normal place. There are some errors (though most are likely to be in transcriptions) - eg in 1839 Margaret Crellin had to go to the Consistorial Court to correct one such error - and quoted another such case as precedent.. If the child was not expected to live it may have been 'christened' at home and later 'baptised' or 'received into the congrgation' in church. Sometimes a family presents more than one child for baptism - possibly triggered by change in circumstance or newly acquired religious conviction (e.g. Cholera epidemics). See comment re strays; in general the marriage tended to be in the wife's parish church. See also separate page on marriage customs etc. See comments re strays; many families would have an established burial plot and thus, especially in later part of 19th century when intra Island migration appeared to be more common, out of parish burials are more frequent. See also page on burial customs etc. Few memorial inscriptions exist that date from before 1680 - early MI's gave little more than name and date of death, later MI's gave considerable more information regarding spouses and/or offspring. The FHS have published lists of MI's from all the Island graveyards. WHEN Mr Feltham published his " Tour through the Island of Mann , in 1798," he contemplated in the "Parochial Tour" to insert a record of all the monumental Inscriptions then to be found in the Churches and Churchyards in the Island, and at page 226 of the Manx Society's reprint of his work, vol. vi, he remarks "that in going to the respective parishes, I took down every inscription in every churchyard except one, Kirk Braddan,) but they occupy such a space that I am deterred from printing them in this volume, yet hope to present them at a future period, as a treasure to the inhabitants, in some detached and cheap form". The notes he left, including a survey of Braddan, were reprinted by the Manx Society in 1868 as Volume 14 of their series of reprinted works -known as Memorial Inscriptions.